The preponderance of planets in air and mutable signs gives the chart a Gemini feel, underscoring the moon's placement in Gemini. The recurring themes of this chart are a talent for mimicry, a suddenness to anger, a need for emotional distance and a knack for using the hands. The sun and Mercury in Pisces indicate an ability to read a situation intuitively. A person with Mercury in Pisces thinks more in symbols than in words; he just picks up and knows things without being able to explain them. This also leads to chameleon qualities — being able to change to match the situation, and to imitate accents and people convincingly, as if he'd become the other person. (He filled in so convincingly for Groucho in one show that he was never given the chance again.) There is a tendency to merge so completely with the environment that it's easy to lose sight of where he (and his real interests) stop, and to either become caught up in problems that aren't really his or interpret everything as a statement about himself, regardless of whether it really has anything to do with him. It would be possible to blend in with the picture, to go along with the grand scheme and not draw too much attention, maybe even to put up with behavior that amounts to being walked on -- but only for so long. There's always a moment of snapping and not being able to take it any longer, at which point the choice is either to stand up for one's self or escape into fantasy, delusion or even substance abuse. (His choice was to leave the act in 1934, after "Duck Soup," and open his own agency.) Because they are in Pisces, the sun and Mercury assist in creating illusion, and so are beneficial for artists and theatrical folk. They also give the potential for great compassion and sensitivity, as well as living in a dream world. It is unlikely, though, that Zeppo was in danger of either making himself a martyr for anyone or getting lost in the clouds, thanks to the counterbalance of a number of aggressive influences. One directly involves the sun, which is in a tense aspect (opposition) to Mars, the planet that shows a person's drive and energy. This opposition indicates a compulsion to test and prove the self through displays of aggression, or at least testosterone. With Mars in the earth sign of Virgo, the impulse would be not to bother with words when a fist would get the point across. Short of provoking confrontation, this aspect would also encourage a stance that would be called macho today. There was no chance of anyone questioning this theater pro's masculinity. Another aggressive influence is a conjunction between Neptune and Pluto in the sign of Gemini, in an opposition to Uranus in Sagittarius. This planetary combination puts an internal volatility in direct and constant contact with psychological demons that normally get shoved down below the surface, and which in this case are magnified by a trick mirror. A good image for this interaction is always having a pack of cigarettes near a gas tank. A conflagration is going to erupt anytime anyone lights a match, even if they're unaware that there's anything around to make the act dangerous. In other words, innocuous comments (made with no intent to provoke) would set off a sudden, unexpected and intense response, due to having punched a button. I would imagine that people who set him off probably had no inkling that they were in danger territory. He may have been taken by surprise as well; this dynamic indicates something flying out from deep in the psyche. Both in air signs, the moon and Venus underscore a need for emotional detachment and freedom. Moon in Gemini indicates a facile conversationalist; combine this with Mercury in Pisces and not only could a person mimic well; he could also ad lib with ease, and probably in character. The moon represents more than just emotions; it shows, among other things, what a person needs for emotional security, how he gets his needs met and how he views his mother. What moon in Gemini needs is space. People with this placement often seem as if they have a wall of air around them. They're friendly and pleasant and easygoing and funny and as delightful as can be and then ... they're gone. They can be amazingly fickle, disappearing suddenly to pursue whatever just distracted them and then flitting back in unexpectedly as if nothing had happened. The fickleness can extend to extend to their attitude about loyalty as well. Moon in Gemini needs to keep things light and anything but serious (as far as their own obligations are concerned), and has the potential for being involved with several people simultaneously (because there is not complete investment in any one of them.) So at the very least Zeppo had a pronounced independent streak and, even when married, would have still considered himself free to do whatever he wanted (which may have been as simple as keeping whatever hours he wanted; I am not implying that he ran around on his girlfriends or wives, though he had the mindset that would have allowed it). He had the glibness to talk his way out of anything. If that didn't work — or if the other person said the wrong thing — he was probably often overpowered by an impulse to use force. The moon also tells a bit about his experience of his mother. (For a comparison of what the brothers' charts say about their relationship to their mother, click here.) According to his chart, his relationship with Minnie was the least complicated of the brothers. His only strong aspect to the moon is a square to the sun, which would show that they were occasionally at loggerheads, and that she pushed him. This aspect suggests that when he did need attention as a sensitive young child, she did not give it to him. With moon in Gemini, he equated her with her mind and her talk. To him, she was independent, mentally resourceful, a fast talker, unconventional and emotionally distant. He did not experience her as a looming, smothering, controlling presence; in fact, she doesn't come across as traditionally maternal in the least in his chart. The Venus placement also indicates an offbeat or futuristic sense of aesthetics (drawn to the latest gadgets, which is also a characteristic of Moon in Gemini), and a creative nature that is inventive and pushes beyond existing rules and boundaries. Mars in Virgo shows that Zeppo was very good with his hands and capable of detail work; he could probably fix lots of things and no doubt, given his Gemini and Aquarian planets, figure out and handle all sorts of new-fangled machines. (He was, in fact, a mechanic for Ford for a while.) It was probably a calming and stabilizing outlet for him to work with his hands, because that would have vented the innate aggressive energy that otherwise came out in conflict. (He was probably a lot easier to get along with when he was tinkering or inventing.) 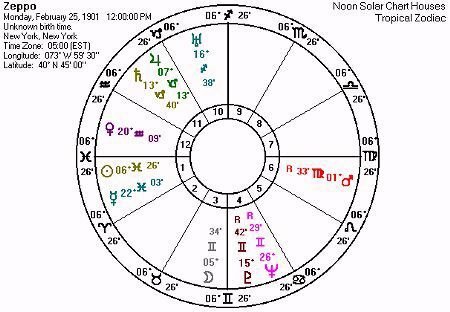 The entire chart shows a great formula for an inventor, in fact: sun in Pisces could intuit a need; the Gemini planets and Venus in Aquarius could dream up a solution, and Mars in Virgo could build a prototype, and Jupiter/Saturn in Capricorn would have the staying power to finish it — and know how to sell it. No surprise, then, that his company manufactured clamping devices used in atomic raids on Japan, and that he helped develop a watch with a heart monitor.